"This recipe is a complement to any brunch or dinner. The name says it all--this dish is super cheesy and a little hot." In a large pot, bring water to a rolling boil before adding the grits. Reduce the heat to low and stir while they thicken. When the mixture is thick, stir in the eggs followed by margarine, cheese, seasoning salt and hot sauce. Stir until the cheese has melted. Pour mixture into a 9x13 inch baking dish. Bake at 350 degrees F (175 degrees C) for 45 minutes. 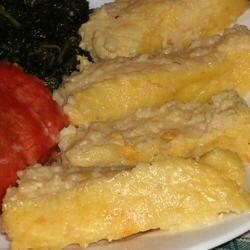 Cut the grits into squares and serve. See how to make this cheesy, custardy comfort-food classic. Very good. I used cheddar rather than American cheese and didn't use the hot sauce. Can this be mixed the day before and covered/set in the fridge? maybe the liquid would get soaked in the grits and not work out for a next morning baking. thoughts?? thanks.